Fez is a puzzle platform game developed by independent software developers Polytron Corporation. The game was initially announced by its creator, Phil Fish on July 17, 2007. It was later announced that the game would come to the Xbox Live Arcade in early 2010, but it was pushed back. The game was released on April 13, 2012, for Xbox Live Arcade. A Windows version became available on Steam and GOG.com on May 1, 2013. OS X and Linux versions are currently being developed by Ethan Lee. 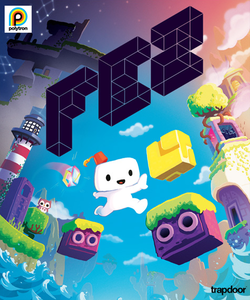 Phil Fish and the later stages of development of Fez were featured in Indie Game: The Movie. The plot of Fez revolves around Gomez, a two-dimensional creature who lives in a flat, 2D world. One day, Gomez encounters a strange and mysterious artifact called the Hexahedron, which gives him a magical fez hat that allows him to perceive a third dimension. Just as Gomez begins to explore his new ability, the Hexahedron suddenly fractures and explodes, causing the world around him to glitch up and freeze. The game "reboots" and Gomez wakes up to find that he can now explore his world in three dimensions. A floating hypercube explains that he must collect the fragments of the Hexahedron, which have been scattered across the world, before the world is torn apart. This page was last edited on 10 July 2016, at 03:09.